The only booklet that has been produced about St Mary the Virgin (other than a pamphlet printed in 1881, which is no longer available) was written in 1934 by W H Yeandle. This has been reprinted once. 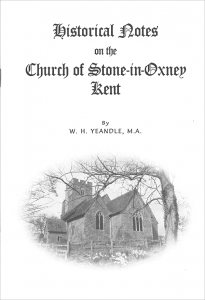 For those who are interested in a detailed guide to the church and its history, “Historical Notes on the Church of Stone-in-Oxney, Kent” is reproduced below as a form of third edition. The illustrations are of poor quality, but this reflects the original reprinted version. Further copies of the booklet are available in the church for a price of £1.